It’s always a tricky decision deciding which moisturiser makes the final cut for your holiday packing. The item in question has to tick a lot of boxes; intense moisturisation, quick absorption, repairing, and, ideally be able to smooth and calm the skin too. As soon as I heard about ResulTime’s Regenerating Collagen Gel ( a Vogue favourite! ) I had a sneak feeling that I might have found The One. The multitasking gel fights signs of ageing, but, more importantly as my holiday essential, hydrates and repairs skin that has been sun damaged by working to repair skin tissue. It’s light formula makes it a pleasure to apply even on sensitive, burnt skin – luckily I didn’t burn too badly on this holiday, but I did miss my hair line on the first day which was a little painful! Thankfully, after using the Resultime collagen gel as a sleep mask that evening, the pain and redness was gone by the following morning. The main selling point of this product is the collagen ingredient – as the main component in connective tissue, responsible for skin’s strength and elasticity – it’s important that we encore the production in our skin cells. The Resultime gel uses Micro-Collagen, which kick starts collagen production in the skin cells. A truly multifunctional product, the Collagen Gel can be used as a serum before your usual moisturiser, a sleep mask, an aftersun mask or a gel moisturiser. It may be with the help of the sun, but even after our four hour flight home, my complexion remained glowing and healthy looking, and i’ve been maintaining the glow back home, using the gel every evening before bed. 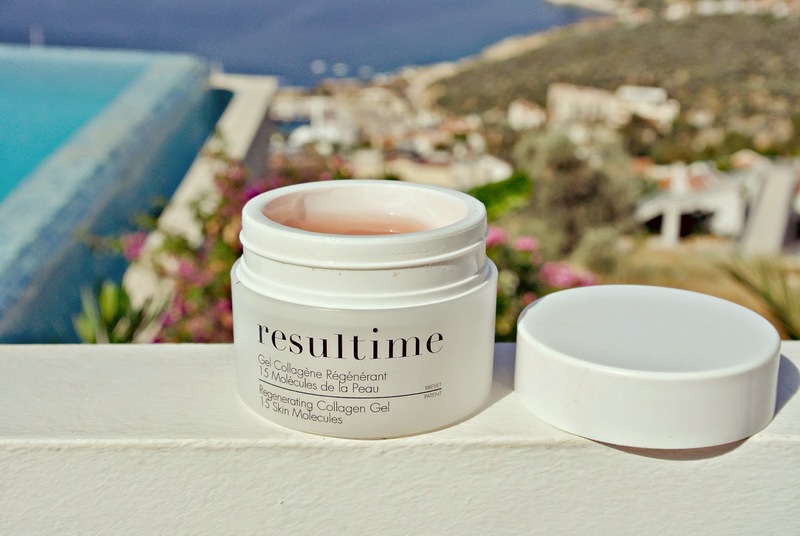 I would recommend the Resultime Collagen Gel to all skin types, and especially if you suffer with sensitive skin while on holiday. Sun exposure used to make my face painfully sensitive – I often had to splash my face with fresh water after going in the sea, and it never tanned, but this holiday I was so pleased not to have any problems at all, and it may very well be thanks to the Regenerating Collagen Gel. The product can be purchased online for £47 via there website, here, and on CultBeauty.co.uk. Have you tried any Resultime products before?